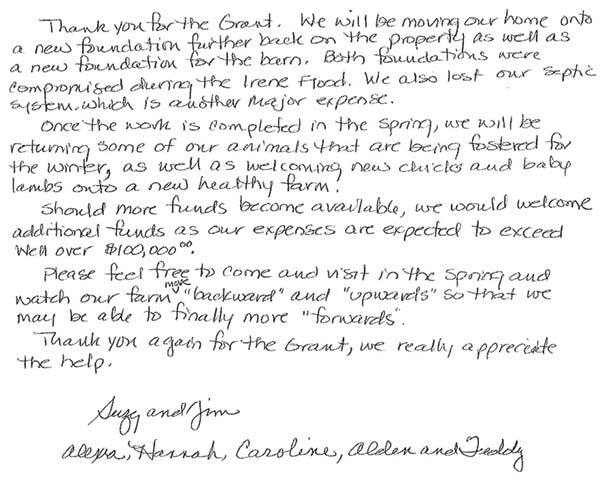 Expand the sections below to read stories about the people and organizations that received Irene-related grants from the Community Foundation. We interviewed grantees in October 2011 and recently talked to them again to see how they are faring one year after Irene. You can also read some of the wonderful thank you notes we received. 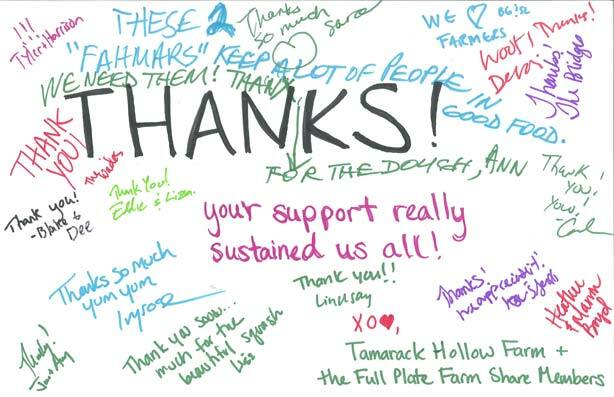 A thank-you note from Diggers' Mirth Collective Farm that received a Vermont Farm Disaster Relief Fund grant. Illustration by Hayden Boska of Diggers' Mirth. 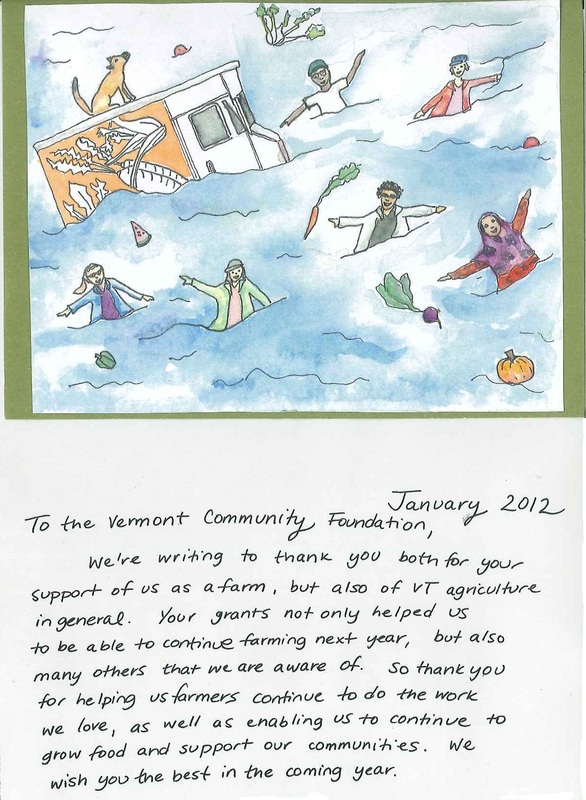 A thank-you note from a farm that received a Vermont Farm Disaster Relief Fund grant. At the Boys and Girls Club of Brattleboro, things are looking up. “We’re in pretty good shape,” said Executive Director Beth Baldwin. The clean-up is done, although the staff might find an occasional bit of silt left over from the day last August when Tropical Storm Irene sent Whetstone Brook backing into the Flat Street building. But the damaged sheet rock is replaced, the building is painted inside and out, and the kitchen has been re-established with two new refrigerators, a new freezer, stove, and hot water heater. The skate park is due for the final touch: new steel plates on the ramps; and the building is due for new carpeting. The club was able to reopen last September 9, but the number of children using the building declined until about the middle of November, Baldwin said. Now the organization, which serves children 6 to 19 at sites in Brattleboro, West Brattleboro, and Bellows Falls, says its overall numbers are up to about 1,100. An engineering study done when applying unsuccessfully for state flood aid has also helped efforts to plan how to better deal with a future flood, Baldwin said. 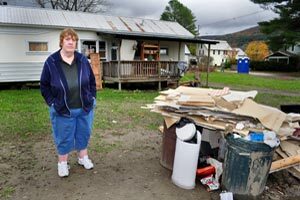 Around Brattleboro, she said, some people are doing well but others continue to struggle financially to recover from Irene. Although it didn’t qualify for federal or state funds, the Boys and Girls Club received a $5,000 Special and Urgent Needs flood grant from the Vermont Community Foundation. Swollen with rain and debris from Tropical Storm Irene, Whetstone Brook rampaged through Brattleboro on Sunday, August 28. When the debris — trees, parts of houses, other buildings, and who-knows what else — hit a downtown bridge it caused a sudden dam that sent water backing into low-lying streets like the aptly named Flat Street, home to the Boys and Girls Club of Brattleboro. Soon muddy water filled the basement of the club, which serves nearly 1,000 kids ages 10 to 19, and covered the floor under its ping-pong tables and in its basketball court and skate park. In the basement, camping equipment, holiday decorations and other odds and ends floated in chest-deep water. When the water receded on Monday, the clean-up began. Staff, kids, parents, and other volunteers filled endless buckets with mud and carried them out to the street. Even when the mud was gone, it took as many as 20 washings of the floors to get rid of the silt. Sheet rock had to be cut two feet up from the floors and dumped; the wooden floor under the basketball court and the ping-pong tables had to be yanked out and thrown away. The mats from the climbing wall were soaked and couldn’t be dried. Into the dumpster they went, along with the camping equipment and the contents of a freezer and a refrigerator. And the appliances went too. Five commercial dehumidifiers ran for a week, each filling about half of a 30-gallon barrel a day with moisture extracted from the air and the building. A large dumpster, a dump truck and a smaller dumpster soon filled with what had been key parts of the club’s work. In addition to parents, help has come from the Boys and Girls Clubs of America and Home Depot, the Brattleboro Rotary Club, the employees of Vermont Yankee nuclear power plant — a longtime supporter of the club — and employees from GPI Construction. Brattleboro’s World Learning/School for International Training made a substantial financial contribution. The national press — CNN, the Weather Channel — had shown up the day after the flood and checks (mostly small, a few larger) came in from around the country. The repair work will continue for months, but the staff believes the club makes a difference in kids’ lives and they wanted to be sure it was open again as soon as possible. “For every hour we’re closed, we lose a kid,” said Ricky Davidson, the unit director. The club opened again on September 9, about two weeks post-Irene. When the Dog River, raging from the rains of Tropical Storm Irene, reached Ann Marie Bolton’s home in Weston’s Mobile Home Park in Berlin last August, she was at work at her second job. By the time she got to the park, she couldn’t reach the home where her daughter, Kristen, then 13, and Ann Marie’s brother, Luis, were marooned. And when Luis and Kristen attempted to evacuate the mobile home, they found themselves surrounded by water. Miraculously, some building material — covered with a blue tarp and buoyed by pink-board insulation that Ann Marie had been saving to fix the mobile home’s roof — bobbed just outside their door. Kristen got aboard and Luis maneuvered their raft to safety, rescuing two other park residents and a cat in the process. Kristen and Ann Marie were safe, but they had no home and had to live separately with different sets of friends for the next six weeks. They were eventually able to move into a FEMA apartment in Barre. 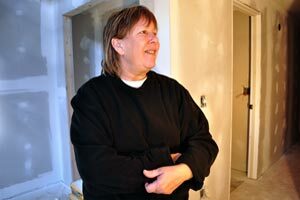 Today, buoyed by help from the Vermont Disaster Relief Fund and the Federal Emergency Management Agency, they are more than afloat: They are on solid, high ground, renovating and moving into a snug house on a hill in Barre Town, far, Ann Marie points out, above the danger of floods. On the anniversary of Irene, Ann Marie and Kristen were into their ninth week of renovating the house they were able to buy outright at a foreclosure auction using money they had saved and funds from the Vermont Disaster Relief Fund. FEMA funds have gone into the renovation work, which they are doing with the help of friends. The Vermont Community Foundation’s Special and Urgent Needs Irene Recovery Fund provided the Central Vermont Community Action Council with $5,000 to help pay for additional staff hours needed in the aftermath of Irene to help people like Kristen and Ann Marie. The Central Vermont Long Term Recovery Committee received $3,500 in SUN funds from Foundation to deal with the recovery from Irene. Tropical Storm Irene pushed many struggling low-income Vermonters—by some estimates 40 percent of those displaced by Irene were low-income—closer to the economic edge. And the storm may have forced some who have not needed assistance before to ask for help. So Irene meant a sudden increase in demand for the services of the Berlin-based Central Vermont Community Action Council, which serves about 18,000 low- and moderate-income Vermonters a year in Lamoille, Washington, and Orange counties; surrounding towns; and through statewide programs. CVCAC had already been forced by federal spending cuts to lay off staff but found itself recalling furloughed workers and extending hours for others, spending money that wasn’t in its budget. The numbers are daunting—more than 800 displaced people and more than 200 destroyed homes across the organization’s multi-county coverage area. Almost all low-income housing in Waterbury, one of the hardest-hit towns in the state, was in the downtown area that was flooded, putting apartments and mobile homes out of commission. Some families had to move five times in five weeks due to changes in funding and in the availability of places to stay. A 73-year-old woman who has lived in Waterbury for 50 years exemplifies the problem. She lost her apartment and needs to find an accessible rental unit in town. “There is nothing,” says case manager Cecile Johnston, working out of the FEMA center above the Waterbury Fire Department, trying to help the displaced cope with Irene’s aftermath. “It’s a real double whammy,” said CVCAC’s community outreach director Liz Schlegel. “You’ve lost a place to live and you have no place else to move to.” Waterbury’s experience was echoed in other flooded towns, and CVCAC, with financial help from the Vermont Community Foundation, National Life, Green Mountain United Way, and Union Mutual, among others, continues trying to help the victims of Irene find the resources and the strength to get past the storm. Tropical Storm Irene broke the links in the chain of the Cross Vermont Trail, the public, multi-use, four-season route that when finished would stretch 90 miles across the state from Lake Champlain to the Connecticut River via the Winooski River and Wells River valleys. In all, 4.5 miles of the trail had to be closed. Working with a $5,000 Special and Urgent Needs grant from the Vermont Community Foundation and partners like the Richmond Trails Committee, Town of Groton, and the East Montpelier Gully Jumpers and Barre Sno-Bees snowmobile clubs, the trail’s staff and volunteers had done much of the major repairs by last winter. But the final work was still to be done. This spring workers planted trees and other new vegetation on the part of the trail that follows the old Montpelier and Wells River railroad bed in East Montpelier and re-established ditching that had eroded there. They did the same on a damaged section of the railroad bed in Groton and were set to finish the work this summer, including repairing and reopening historic granite culverts. Meanwhile, they established a temporary bridge over Johnnie Brook in Richmond and plan to complete a permanent bridge in the fall. "We are working now to do finish work that will make the repairs sustainable and long lasting," said trail programs coordinator Greg Western. The concept of the Cross Vermont Trail is simple: a public, multi-use, four-season route 90 miles across the state from Lake Champlain to the Connecticut River via the Winooski River and Wells River valleys. For the dedicated group of professionals and volunteers that make up the Cross Vermont Trail Association, making the concept a reality is more complicated. Their efforts to maintain and expand the trail involve working together with many local groups to stitch together pieces of existing public trails and paths, raising funds to build new sections, and developing signs and routes on public roads to connect the trail. So when flooding from heavy rains hit last spring, the fabric was torn in several places along the 30 miles of already completed trail. The organization went to work to repair the damage and made good progress. Then, last August, Tropical Storm Irene smashed culverts and washed out other drainage areas, taking out 4.5 miles of trail in five towns. The good news was that repairs made from the May flooding held up. The bad news: to avoid problems in the spring, the new washouts had to be repaired before winter. Over the fall, with a $5,000 Special and Urgent Needs grant from the Vermont Community Foundation, the organization worked with partners like the Town of Groton, the East Montpelier Gully Jumpers and Barre Sno-Bees snowmobile clubs, and groups in Richmond to complete the rebuilding. By mid-November almost all the gaps were repaired. In the spring, the association will organize groups to finish the work by planting vegetation at the sites. 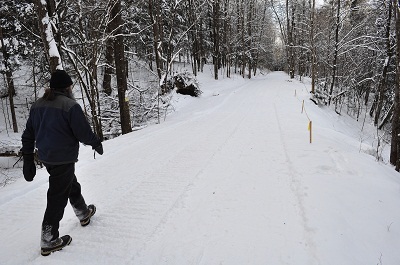 “The Community Foundation grant opened up all those closed miles of trail,” said Cross Vermont Trails Association trails program coordinator Greg Western. Up-to-date information on the trail’s status is at www.crossvermont.org. Diggers’ Mirth’s 2012 farming season promises to be far better than last summer, when Tropical Storm Irene ravaged its produce garden in Burlington’s Intervale. In fact, it may be the collective’s strongest season since its founding in 1992. Last year Irene took 60 percent of the harvest, but this year by late July the group’s 12 acres of melons, salad greens, carrots, beets, onions, garlic, herbs, cucumbers and eggplants were doing well. 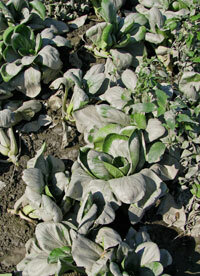 The bok choy, rutabagas and winter squash that will be harvested later were coming along. 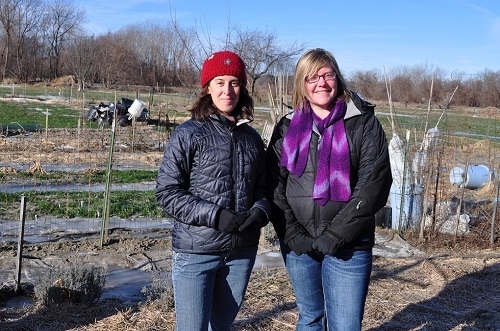 Diggers’ Mirth, which sells produce to Burlington’s City Market, Healthy Living Market and Café in South Burlington, and eight local restaurants, received a $3,000 grant from the Vermont Community Foundation’s Farm Disaster Relief Fund to prepare for 2012. The other Intervale farms have rebounded, too, although those that depend on perennials, such as strawberries, will take a longer time to recover, De Santis said. The day after Tropical Storm Irene pummeled Vermont, the five members of Diggers’ Mirth farming collective—Dylan Zeitlyn, Elango Dev, Hilary Martin, Hayden Boska and S’ra De Santis—knew that storm’s flood waters would come calling in their fields in Burlington’s Intervale, the swath of reclaimed farmland nestled in a sweeping bend of the Winooski River where it nears Lake Champlain. After all, Diggers’ Mirth has been farming in the Intervale since the group’s founding in 1992. Its members had seen the Winooski flood many times and—given the torrential rains that had hit the areas upstream of Burlington the day before—they thought they knew what would happen. But this time was different in speed and ferocity: with very little warning the Winooski jumped its banks and quickly shouldered its way into the Intervale, covering the access road, and nearly trapping the Diggers’ Mirth farmers and 25 volunteers who were working at top speed to harvest what they could of the season’s crops. “We’d never seen a flood like that,” said S’ra De Santis. The pickers barely made it out in time before the garden—six acres of produce and three acres of cover crops—was under several feet of water. They managed to harvest about 1,000 pounds of produce and store it temporarily in a walk-in cooler space offered to them by the Burlington School District. But they still lost at least 90 percent of their crop, and their truck was damaged by flood water. Assistance in the form of a $3,000 grant from the Community Foundation’s Farm Disaster Relief Fund will help them pay off some Irene-related expenses and get ready for the upcoming planting season—and what they hope will be a much better harvest this year. Rebuilding community gardens from the effects of Tropical Storm Irene has been a bad news/good news experience for the Vermont Community Garden Network. The bad news was, of course, the flooding that destroyed eight of the organization’s more than 300 member gardens in August of 2011 and damaged many others. The good news: How those eight gardens have been rebuilt and improved. “It’s really amazing to see the difference,” said Jessica Hyman, executive director of the Vermont Community Garden Network and Friends of Burlington Gardens. The organizations received a $5,000 Special and Urgent Needs grant from the Community Foundation and additional support from the Episcopal Diocese of Vermont to help community and school gardens rebuild after the flooding. The damage in the gardens in Hardwick, Montpelier, White River Junction, Woodstock, Quechee, and Chester ranged from sites that were completely wiped out to those that lost topsoil and fences. Soil contamination was not a major issue, but there was a lot of work to be done. Most were able to prepare for the 2012 gardening season by purchasing and spreading new compost and topsoil. Some needed new fencing or irrigation equipment. Some of the gardens were moved to spots less likely to flood. Hardwick not only moved its garden to a less flood-prone area but also added four handicapped-accessible plots. In some cases, perhaps the biggest reward was the stronger sense of community that developed as gardeners rallied to rebuild. “Our garden truly represents recovery to the community,” said Quechee Community Garden coordinator Pamela Vernon. Gardens tend to thrive next to waterways: the soil is often better there than elsewhere, there’s usually good sunlight, and the land is fairly flat, a real bonus in a hilly state like Vermont. But when rivers and creeks flood, it’s a different story, as Friends of Burlington Gardens (FBG) knows well. Flooding from Tropical Storm Irene devastated the Tommy Thompson Community Garden in Burlington’s Winooski River Intervale, destroying the crops of about 150 households. Irene also wiped out gardens in Hardwick, Chester, and Woodstock and damaged many other plots that are among 200 gardens in the Vermont Community Garden Network, which Friends of Burlington Gardens leads. One of Friends of Burlington Gardens’ responses, through a $5,000 Special and Urgent Needs grant from the Vermont Community Foundation and additional support from the Episcopal Diocese of Vermont, was to set up a mini-grants program for flood-damaged community and school gardens around the state to help pay for soil tests to determine if gardens have been contaminated by flood waters; to provide soil amendments, fencing, and other materials; and for technical assistance to get damaged gardens ready for the growing season. In March, FBG awarded flood recovery grants to eight community and school gardens around the state. Gardens in Chester, Hardwick, Montpelier, Quechee, White River Junction, and Woodstock will receive up to $1,000 each to help rebuild or relocate secure food production sites. In the aftermath of Tropical Storm Irene, young farmers Kara Fitzgerald and Ryan Wood Beauchamp faced a difficult decision. Irene had swept their five acres of riverside crops down the Mill River, along with their topsoil, greenhouse, and irrigation system. They received a grant from the Vermont Community Foundation’s Farm Disaster Relief Fund and a loan from the Northeast Organic Farming Association of Vermont as well as donations from many individuals. Although they were committed to farming in the long run, they were unsure about the next season: Should they find work elsewhere while they collected themselves and looked for new land to buy or should they jump back into farming somehow and plant for a 2012 harvest? Friends made the decision easier: One offered to allow them to grow crops on four acres uphill in the town of Shrewsbury and another, at P.J. Bushey’s nursery in East Wallingford, offered greenhouse space to start their spring plants. “We ended up deciding to go for it,” said Wood Beauchamp. And this time, the weather cooperated. A warm spring meant that in March they were able to plow the field, which had not been planted recently, and start working the soil for spring planting. They had started garlic on the plot in the fall and in the spring planted tomatoes, cucumbers, squash, beans, peppers, greens, and more. This summer their community supported agriculture program has 70 members and they have had a good season selling produce at the Rutland and Ludlow farmers’ markets. In the meantime they are in the process of buying part of the parcel where they have been growing this year. And they’ve been busy growing winter-storage crops like potatoes, beets, winter squash, cabbage and, rutabagas to tide their customers over to spring. “We’re really looking forward to being able to provide locally grown, healthy, nourishing food year-round,” said Wood Beauchamp. When Tropical Storm Irene swept into Vermont, Kara Fitzgerald and Ryan Wood Beauchamp prepared for the effects of high winds on their five-acre field of vegetables. They picked tomatoes and otherwise battened down their small produce farm. This was their first growing season on the land they had bought in 2010, a flat piece of an old farm tucked in between the Mill River and a bend in Route 103 just south of Cuttingsville, near Rutland. They had built the soil with compost and cover crops. They had 50 customers signed on for their Community Supported Agriculture program and they were having a great harvest. On Monday morning after Irene, the river, normally a small, rocky stream in the fall, was rising alarmingly fast. Soon it was higher than it is during spring runoff. By 11:15 it was coming over its banks. Fifteen minutes later torrents of water and huge waves roared across their field. “The arugula’s going to be ruined!” thought Kara. “I hope we can still dig the potatoes.” “Never in our wildest dreams did we think there’d be a river where our vegetables were,” said Ryan. But that’s what happened. The Mill River formed a new channel across their crops and scoured away the topsoil, their greenhouse and their new irrigation system, leaving a field of jumbled rocks, sand, and boulders. And almost no sign of their work. Since then they have been trying to serve their customers with what they had harvested before the flood and some new greens that they have started, but one thing seemed abundantly clear: Their young farm was gone. There was no soil to grow on. They decided they would have to find another piece of land for the next growing season. Fitzgerald and Wood Beauchamp, who met at Earlham College, a Quaker school in Indiana, have found great support for farming in Vermont, from their neighbors to the state Department of Agriculture. In addition to a grant from the Vermont Community Foundation’s Farm Disaster Relief Fund, they have received help from the Northeast Organic Farming Association of Vermont and the Vermont Farm Fund as well as donations from many individuals. One of their customers cried when they returned to the Rutland Farmers’ Market with the remnants of their crop. A fellow farmer gave them use of an acre and a half to grow fall greens. By mid-October they were ready to offer their CSA customers a produce pick-up. It wasn’t big, but it was something. Despite the hand that Irene dealt them, Ryan said, “I still think we made the right decision moving here. In the Dog River valley of central Vermont, the winter of 2011–12 started late and was blessedly short and mild, all of which helped the Herring Family Farm recover from the ravages of Tropical Storm Irene. It meant that Michael Herring had plenty of time to clean up from Irene, repair damaged fields, and plant winter rye. In the spring, it meant warmer weather helped his greenhouses nurture the starter plants he sold to customers and then planted for his own vegetable crops. 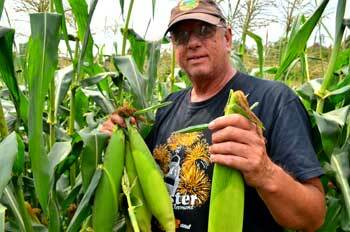 This season he has two acres of vegetables at his farmstand on Route 12 south of Montpelier, five acres of vegetables nearby and, near the farmstand, 12.5 acres of tall corn cut into a maze designed to attract and stymie paying customers. At the end of the fall, he’ll cut the corn to feed his beef cattle. The weather this season has been good so far, but the traffic at his stand has been less than he’d hoped. He attributes the slowness to the lethargic state of the economy and the fact that there are two other farmstands along Route 12, not far from his. Even the excavation work he usually does in addition to his farm work has dwindled this year, again, he believes, because of weakness in the national economy. Sales of the beef and pork he raises have been good and help support the vegetable operation. Last year he had four or five people helping him, this year, to save money, he hired only one person and then for only a week. His goal is to keep the family farm going. “I’ll keep whittling away at it and see what happens. I have to,” he said, adding: “Farming’s a good life, and I have proof of that,” citing his 95-year-old mother, who, until her death in August, worked in farming every day of her life. 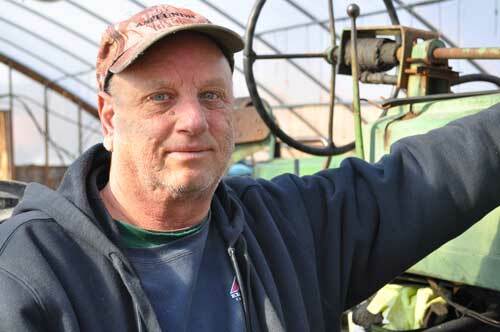 “Farming’s a good life,” says Michael Herring, “it’s just a hard one.” That was never more true than when Tropical Storm Irene flooded Herring’s fields in late August, sweeping away 10 acres of corn, five acres of vegetables, and a new greenhouse. The Herring farm, in the narrow Dog River Valley between Montpelier and Northfield, has been in the family for three generations. In between the hills that rise above the river there is room only for Route 12, a few houses and fields, the river, and the railroad tracks on which Amtrak’s Vermonter clatters by every day. When his father died seven years ago, Herring left his career as a builder to keep the family farm going and coax a living out of the land with a produce stand; sales of chicken, pork, and beef; and additional work as an excavator. When Irene hit, he went about a half-mile downstream to help his neighbors at M’s RV Sales deal with the flooding. The river soon cut off the road back to his farm and he didn’t make it home until 3 a.m. after hitching a round-about ride with the National Guard. The washed-out corn field was going to be a corn maze in the fall and then feed for the cows. The greenhouse had been built in the spring. The crops of lettuce, cabbage, carrots, tomatoes, squash, beets, radishes, and spinach were going to be mainstays of the farm stand. The destruction of all that left Herring scrambling to pay bills without a season’s income. 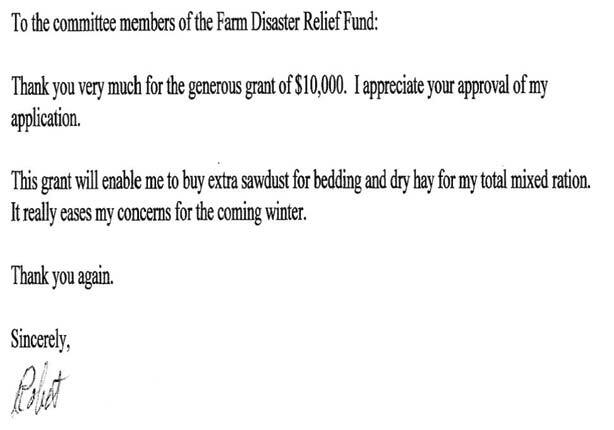 A $7,000 grant from Community Foundation’s Vermont Farm Disaster Relief Fund helped buy feed for his animals and will help with the costs of spring planting. “We’re going to keep working on things and if we get through this year, we’ll recover,” he said. In the aftermath of Tropical Storm Irene, the need for temporary housing for people displaced by flooding in Central Vermont was great and immediate. “Housing was in crisis from the moment of the storm,” said Mame McKee of Rebuilding Waterbury, a volunteer group that sprang up to deal with the massive problems in Waterbury, where much of the downtown, including most of the town’s affordable housing, was flooded. Officials at Home Share Now, a Barre nonprofit that specializes in long-term matches of people in need of housing with people willing to share their homes, knew that their organization could help. Home Share Now, which received a $5,000 Special and Urgent Needs grant from the Community Foundation to support increased staff time, placed ads in local newspapers and put brochures in affected towns and at FEMA centers offering its services to help people find temporary housing. About 15 households needing shelter and more than 30 offering places for people to stay contacted the organization. Home Share Now then did background checks on all involved and passed the information on to housing coordinators such as Rebuilding Waterbury to help work out temporary housing options. “Home Share Now, thanks in part to the Community Foundation grant, was able to offer Waterbury and other communities an added layer of assurance by performing background checks to alleviate the concerns sometimes associated with hosting a stranger,” said Home Share Now executive director Christina Goodwin. Rosemary Sprague is looking for a new place to live. On the afternoon of August 28, she was sitting at home in Northfield in the mobile home she has rented for 15 years. She had just returned from her shift working at the dining hall at nearby Norwich University. She said she felt “calm and cool,” ready to ride out Tropical Storm Irene. But that changed in a hurry. Water from the Dog River, which is normally about 100 yards away but was already flooding, began spilling into her yard. Soon it was rising over her porch and she watched her garbage cans float away. She called 911 and within a short time two EMTs were escorting her out of her home through cold, chest-deep water, one on each side. “Don’t let go!” she told them. 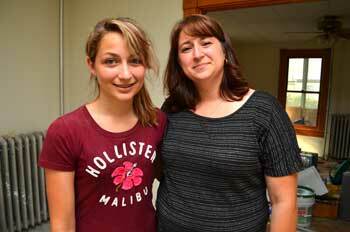 She was able to stay with a neighbor overnight and then moved in with her mother in Northfield Falls. But she had lost all of her appliances and other belongings and she knew she’d have to find another home. At work, where she missed only one day because of the flood, a co-worker mentioned Home Share Now, a Barre non-profit that matches people seeking places to live with others who have space in their homes. Home Share Now is one of the organizations that has received a grant from the Vermont Community Foundation’s Special and Urgent Needs flood-relief program to help it meet the additional workload anticipated because of people displaced by Irene. Almost a year after Irene, the Ice Center of Washington West provides central Vermont with continuous skating options from 6 a.m. and on into the night. What happened was that the Winooski River filled the 3,000-square-foot building with water, mud, and silt last August. Despite that, the nonprofit Ice Center was open for business on October 15, 2011, less than two months after the flood. Although additional detail work continued into the winter, most of the clean-up and repair—with aid from the Vermont Community Foundation’s Special and Urgent Needs Fund and help from Revitalizing Waterbury, the Vermont Irene Flood Relief Fund, personal donations, and many volunteers—had to be done immediately because the rink simply couldn’t open without it. “A lot of it had to be done before we opened our doors, so there was a huge push with our volunteers and staff,” said Lilly. Still, the rink lost almost two months of income due to the flood and the overall number of users has dropped slightly, primarily because state office workers displaced by Irene have not yet returned to the Waterbury office complex. That affected the number of recreational skaters who came to the rink at noon on weekdays. But state workers will eventually return to Waterbury, and in the meantime, the rink has worked to create new adult hockey leagues and clinics and a new skating club to provide learn-to-skate and figure skating programs. Cleaning the mud and silt out of your house after a flood is bad enough, but what if you happen to own a 3,000-square-foot hockey rink? That was exactly the problem facing the Ice Center of Washington West in Waterbury in the aftermath of Tropical Storm Irene. The Ice Center is a year-round skating facility serving youth and adult hockey players, figure skaters, and recreational skaters in central Vermont, and even though it was late August, the center was open — until the swollen Winooski River overran it, submerging the building. Flood water three feet deep destroyed the ice and left the center buried under a layer of silt and mud, damaging everything less than four feet off the ground. Drywall had to be ripped out and replaced. The mechanics of the ice rink — pumps, circulators, and refrigeration equipment — had to be replaced or rebuilt. The snack bar and its freezers and their contents were ruined. Cabinets, all the office furniture, 70 pairs of rental skates, and lots of personal gear owned by skaters was lost. On the bright side, on Monday morning, the day after the flood, a flood of volunteers showed up and the rebuilding work began. People came from the area, from out of town, and from among the central Vermonters who had built the center in 2003 as a community effort. Working with aid from the Vermont Community Foundation’s Special and Urgent Needs Fund as well as help from Revitalizing Waterbury, the Vermont Irene Flood Relief Fund, personal donations and that flood of volunteers, the center reopened 48 days after Irene devastated it. This winter it will serve approximately 4,000 skaters in five youth hockey organizations, nearly 10 adult teams, and other recreational groups. After what was almost a knockout blow from Tropical Storm Irene, the Stone Village Farmers Market is back. The farmstand on Route 103 just north of Chester’s historic stone houses, lost virtually all of its 2011 crops when rains from Irene flooded the Williams River and swept through the 18 acres David Cram and partner Anna Coloutti rent. The flood not only took the crops—squash, cucumbers, zucchini, gourds, sweet corn, tomatoes, and 15 tons of pumpkins—but it took topsoil and deposited a layer of sand. A $10,000 grant from the Vermont Community Foundation’s Vermont Farm Disaster Relief Fund helped keep the business going and enabled it to prepare for the 2012 season. The farm used a subsoiler plowing attachment to reach more than two feet below the surface to bring up better soil and turn the sand under. The subsoiler also breaks up compacted soil to allow better drainage and better growing for roots. With help and manure from Rhomain-Wai Farm, a nearby dairy operation, the fields were ready for spring planting. Dry conditions early in the season slowed growth, but the farm started picking sweet corn July 20, a few days earlier than usual, and by late July, the first tomatoes were ready. “Thanks to the Vermont Community Foundation, we’re getting through it,” said Cram. The Williams River valley has been gradually recovering from the flood too. 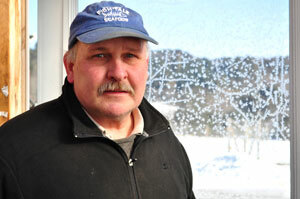 “Vermonters are resilient and they keep kicking,” said Cram. He noted that the fertile soil in the bottomlands along the river was originally deposited by floods. “We just got to keep working that sand and bringing the good soil up,” he said. Almost 30 years ago David Cram and his partner, Anna Coloutti, put a table next to Route 10 near their house in Gassetts to sell some of the extra vegetables from their garden. Sales went so well that summer that they added another table the next season. And then a lean-to to shelter the produce. Pretty soon they found themselves with a five-acre garden. And in the next few years they expanded until they had almost 15 acres of crops. At that point, 21 years ago, they moved their roadside operation to Chester, where their Stone Village Farmers’ Market (named for the historic stone buildings down Route 103 in Chester village) keeps them busy from March through Christmas. They now farm about 18 rented riverside acres and sell everything from tomatoes, pumpkins, sweet corn, cucumbers, and squash to cut flowers and potted plants. They also sell locally-produced products like maple syrup, cheese, and baked goods. Like many, they thought Tropical Storm Irene posed mostly a wind threat, but it was the rain, pouring off the mountains and into the Williams River, that destroyed their crops—squash, cucumbers, zucchini, gourds, sweet corn, tomatoes, and 15 tons of pumpkins. “I watched it go,” said Cram. The Vermont Community Foundation’s Vermont Farm Disaster Relief Fund provided them with $10,000 in grants to get ready for the coming planting season. It was the only aid they have received except for a few donations from customers, a low-interest loan through the state’s Department of Agriculture, and a donation of winter rye seed from the R.B. Erskine Grain Store in Chester. So far the summer of 2012 has been good at Westminster Organics, which grows roughly 150 acres of produce it sells to food co-ops, organic food distributors, and outlets like Whole Foods markets. “We have a lot of good crops and we’re selling a lot,” said Paul Harlow, who runs the farm with family members. It’s been a better summer all around compared to 2011, which was wet, even before Tropical Storm Irene hit, destroying $250,000 worth of Westminster Organics crops. The farm was lucky because despite the flooding, there was almost no soil erosion and very little debris to pick up from the fields. A grant from the Vermont Community Foundation and loans from Northeast Organic Farming Association of Vermont and the Vermont Farm Fund helped with the recovery, but it will take time. The only down side to a good year like 2012, he said, is that the farm’s been so busy harvesting and selling that it has fallen behind on weeding fall crops like parsnips and celeriac. By mid-August of last summer, Paul Harlow thought the only problem Westminster Organics was going to have was where to get enough bins to put all the crops when he and his family harvested their 150 acres of organic produce. Then Tropical Storm Irene arrived. At first, it seemed as though the flooding would miss the farm, despite the fact that it is a short distance from the Connecticut River. And even though flooding was likely, the Harlows had some time to prepare, moving low-lying pens containing nearly 700 chickens and harvesting what crops they could. But by Monday, August 29, the river — full from the rains that had inundated Vermont and New Hampshire upstream from Westminster— backed into fields full of pumpkins, cabbage, parsnips, winter squash, peppers, and collard greens. Soon nearly 30 acres of crops that had been nearing harvest were underwater and lost. It was the first time the Harlows’ fields had been flooded on that scale since the summer of 1973. The Harlows, whose family settled in Windham County in the late 1700s, had to plow the crops under and scramble to recoup the losses, which Harlow estimated to be about $250,000. Aid came from the Vermont Community Foundation’s Vermont Farm Disaster Relief Fund, Northeast Organic Farming Association of Vermont, and a zero-interest loan from the Vermont Farm Fund established by Pete’s Greens. The Harlow Farm has also begun selling Vermont Farms T-shirts to try to close the gap. Now the farm is in the process of harvesting the lettuce, kale, beets, rutabagas and turnips that were untouched by the flood. And if you stop by the Harlow Farm farmstand on Route 5, you’ll find it surrounded by big, beautiful orange pumpkins. Unfortunately for the Harlows, they had to buy the pumpkins from other farmers, who escaped Irene’s wrath.